In Oregon, a meteor crashes into Crater Lake and heats the water, hatching a dinosaur egg. Months later, fishes have vanished from the lake and a huge dinosaur hunts cattle and human to feed. The local Sheriff Steve Hanson (Richard Cardella) investigates the mysterious disappearance of tourists and even a criminal. He also tells to the rednecks Arnie Chabot (Glenn Roberts) and Mitch Kowalski (Mark Siegel) that they shall not rent their boats to the tourists. When he discovers the dinosaur, his friend Richard ‘Doc’ Calkins (Bob Hyman) and two scientists asks him to leave the animal alive for the scientific community. Will Steve let the dinosaur live? 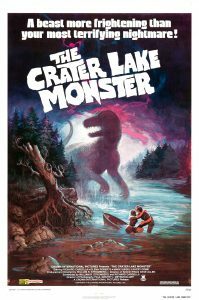 “The Crater Lake Monster” is a terrible and lame dinosaur film with awful story, screenplay, performances and special effects. The characters Arnie and Mitch are annoying and unfunny. There is a thief and murderer that appears in the middle of the story only to be eaten by the dinosaur in one of the most ridiculous scenes. When the sheriff discovers the existence of the dinosaur, he does not summon the army or the National Guard and prefers to confront the animal with a revolver and a bulldozer. The DVD from Rhino is very poor, without subtitles or extras; therefore adequate for this shameful flick.